Resource Efficiency Wales use our twenty years of behavioural change and kerbside recycling services knowledge to assist the public sector in upskilling it's workforce on recycling and waste management services and developments. Together we have assisted well over 1,000 public sector staff to date. ​"What goes in the red box?" 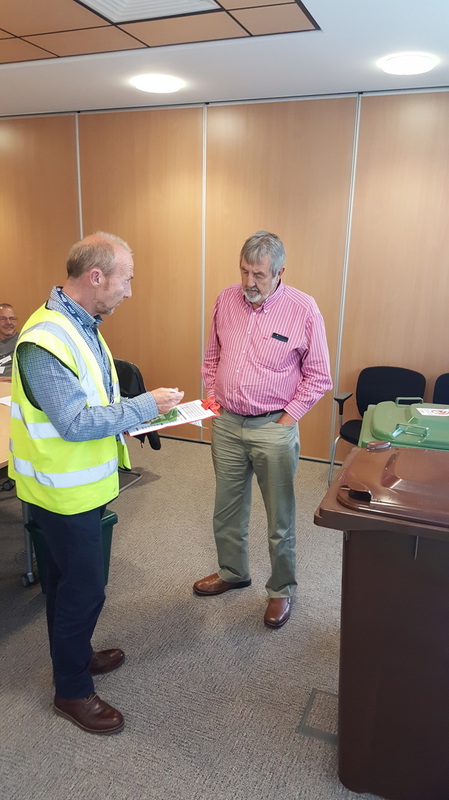 REW were asked to formulate an internal training package for staff to upskill their knowledge of what can and cannot be recycled in the kerbside recycling red box. Over 100 staff and Councillors took part. 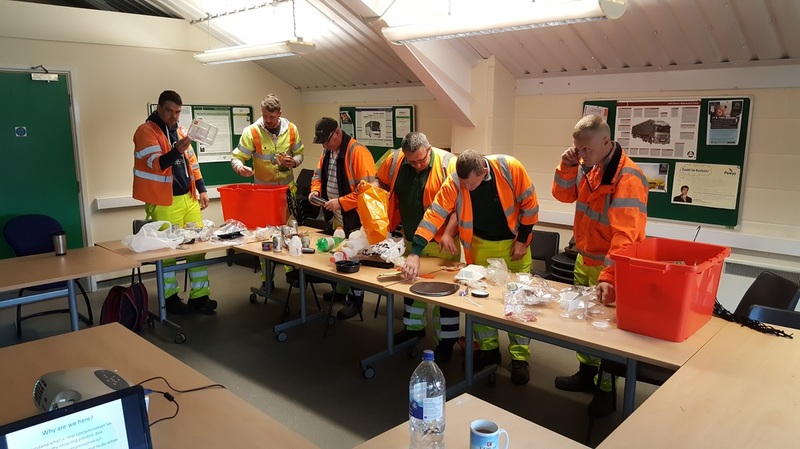 REW responded to a request from Merthyr Tydfil County Borough Council that their HWRC site contractor staff undergo a package of training to help enable them engage with customers effectively. ​"Trolibocs - where we've come from, where we're going and why!" The Council underwent a major service change to the kerbside recycling system. REW were on hand to provide internal training to over 120 staff and forty Councillors as to why the changes have happened, and what materials can and cannot be accepted in the new service. ​"Where we've come from, where we're going and why!" 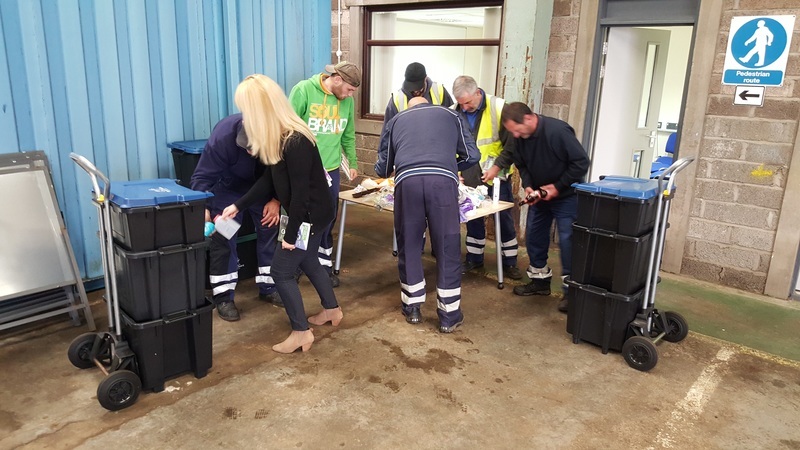 "How to effectively engage with residents to improve food waste recycling participation rates"
REW assisted the council to pre- monitor recycling behaviour and then train a team of fifteen doorstep recycling advisors. The training included a trip to the food waste recycling facility and overseeing best practice delivery style with the public. 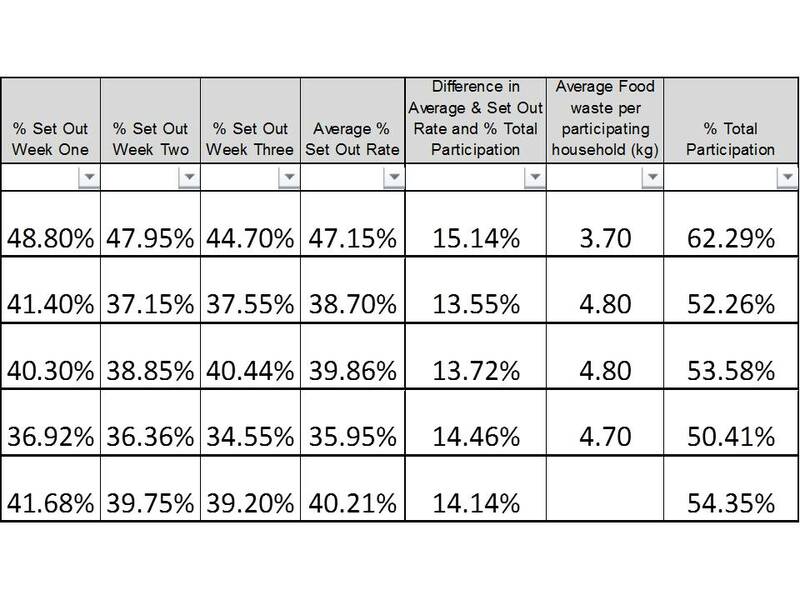 "Set out rate and participation monitoring guidance"
The waste strategy team requested REW assist in developing a database to allow the authority to record and measure public participation in food waste and dry recycling services. REW did this by providing full training and assistance in the output report which enabled management to make budget based decisions on future allocation of resources and promotional work. "In conclusion we found that the increased awareness to all parties resulted in the public receiving more qualitative information leading to a reduction in contaminated recycling bags. Many thanks to James and we look forward to working together during our next period of major change." "Blaenau Gwent CBC enlisted James Kay through REW to carry out training to frontline staff, management and members on kerbside recycling. The training was really useful to raise people’s awareness on the importance of recycling particularly the value of materials on what the authority could earn for selling the material on. Overall the response was very positive and we would be keen to work with James in the future to carry out further training." "PCC used REW to train our crews and staff regarding changes to our recycling system for plastic materials. The training provided was very well delivered, comprehensively researched and really informative. I have no doubt that the training played a big part in the successful transition of our service." "The training was well received by all members of the team, particularly with James’ laid back real life attitude obtained through a significant amount of first-hand experience – the favourite amongst the team was James’ ability to pretend to be an old woman, with not a care in the world about recycling. We’ve since been able to use the training presentation to train additional members of staff in house which has been quick and efficient for us. We particularly appreciated the additional support with excel templates and interpretation of the data collected, as a novice the data can be quite daunting but the assistance in understanding it has really helped shape further targeted campaigns."